Posted: Tue Mar 26, 2019 1:15 pm Post subject: Center or End entrance? 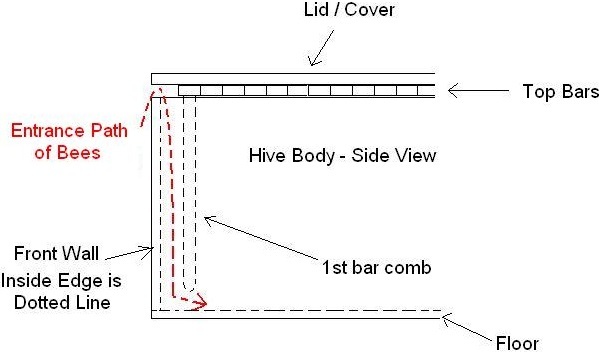 I have been researching top bar hives and at this point that I'm curious about is the entrance design choices. I've noted that the Philip Chandler design has the entrance in the middle of the side. The other item of note, is the PC design has the entrance at the bottom and the MB design, clearly on the top. Is there a strong reason for either of these designs? Or is this merely personal preference? Posted: Wed Mar 27, 2019 3:44 pm Post subject: Re: Center or End entrance? I think I read that Phil ( @biobees ) had later opted for end entrance as being better for managing a TBH in northern climates. periscope entrance and one follower board. I have however on one of the other threads about this, given one reason why centre entrances can be detrimental to the bees in that it can lead to isolation starvation in cold winter climates and you yourself have given another that is potentially detrimental to the beekeeper as there is a less defined honey area for harvest.
" The need to have the cluster at one end of the hive at the beginning of winter (at least in Northern climates) so they don't work their way to one end and subsequently starve while leaving stores at the opposite end because of indecision. This is easily done by simply moving the bars containing the cluster to one end and putting the bars they replaced at the other. With the entrance on the end this is almost never a problem. With the entrance in the middle you are almost guaranteed to have this problem. " I have made two hives with central entrances and two with border entrances, although not directly on the border, rather on the front but at both ends with an entry sas as depicted before. Interesting! Thanks for the replies. I feel I may have found a spot close to my house which will accommodate a few hives. I'm currently pondering hTBH vs Warre. Certainly removing the need to lift boxes gives one point for the hTBH. I also need to be able to build these myself, as I don't have the budget to buy. As catchercradle mentionned it, I forgot to add the advantage of side entrances is that you can host two colonies in the same hive. It is not that the Warré hive is bad, it is probably because the bees I'm using (a local variety of carnica) and the climate (short season) are not the perfect fit for this hive. As an aside, I am discovering a lot of advice I have been reading is difficult to qualify just as you pointed out, because people's bees and climates vary so much. This is ignoring the temperment of the beeKEEPER (rather than the bees). Eventually I'll need to much in and figure it out for myself, but for now I'll keep reading. To me, this is one of the most important things to learn about Bee Keeping. All bee keeping is local. Here in Cambridge, (not too far from St. Albans) there are differences even in moving a few miles. Those who have bees out in the countryside and also in the city often get a better crop from the city bees because of the range of stuff in gardens and the mono-crop deserts that form the agricultural landscape here. My Warré hive for instance had five boxes last year.